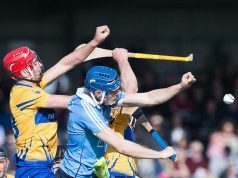 The Clare U-21 Hurlers secured a historic three in a row Munster titles on Wednesday evening in front of an attendance of 12,995 at Cusack Park, Clare dominated the tie from start to finish and there was nothing that this inferior Cork side could do to grab a hold of the game. 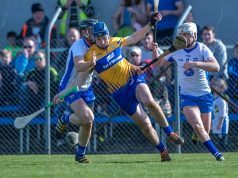 Clare showed their intent early on with points from Aaron Cunningham, Bobby Duggan and two from captain Tony Kelly giving them a four point advantage with six minutes played. 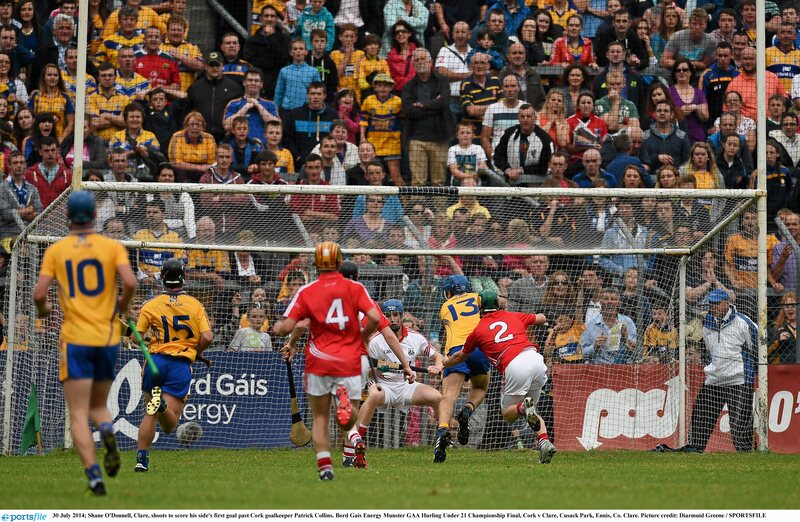 Cork got off the mark on the ninth minute when Carrigaline’s, Robert O Shea slotted over a placed ball. The Banner responded with a long range effort from Peter Duggan and two points from the reliable Bobby Duggan to stretch their lead. 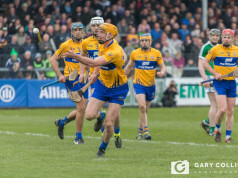 Further points from Cunningham and Bobby Duggan gave Clare an eight point lead with twenty minutes played. Just after Duggans point, Cork netminder, Patrick Collins saw his puckout caught in the air by Kilmaley man, Eoin Enright, who then gave a pinpoint pass to Cunningham who popped the ball to David Reidy who handpassed to Shane O Donnell and he did what he does best and slotted past Collins in the Cork goal. The Banner pushed on from this with points from Colm Galvin and two more from Clarecastles Bobby Duggan. Cork substitute, Mark Sugrue got his name on the scoresheet with twenty three minutes played as he hit straight between the sticks. Bobby Duggan and Robert O Shea exchanged scores on two occasions to maintain the gap. Michael Collins pointed for the Rebels as halftime approached but Clare replied with Bobby Duggan to leave it 1-15 to 0-05 at the interval. Cork were quick off the mark after the resumption with Michael Collins pointing straight away. Peter Duggan got his second of the evening but Cork responded with a point from Robert O Shea. Further points from Bobby Duggan and David Reidy pushed Clare fourteen points ahead with four minutes played. 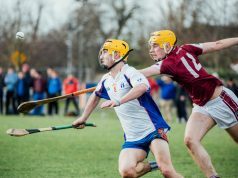 O Shea added to his tally for the Rebels but an accurate pass off the stick of Tony Kelly found Aaron Cunningham who slotted the sliotar over the bar with ease. 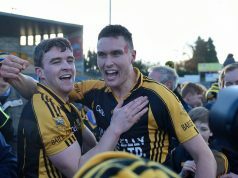 David Reidy and Killian Mc Intyre swapped scores with seven minutes on the clock. 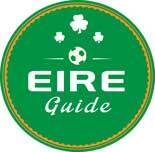 Alan Cadogan had a chance to raise a green flag for the Rebels but his shot was saved well by Clare keeper, Keith Hogan. The Leesiders took their next chance however, as a goalmouth scramble saw Anthony Spillane kick the ball to the back of the net. Clare replied though with points from Tony Kelly and Colm Galvin. Points from O Shea and Shane O Keeffe gave the loyal Cork fans something to cheer about. Further efforts from Galvin and Cunningham pushed the Banner further ahead with twenty one minutes played. O Shea popped over a free for the Rebels shortly after. Points from David Reidy, Shane Gleeson (x2) and Cathal Tots O Connell sealed the win but it was Cork’s Michael Collins who got the last score of the evening. Cork will be very disappointed with their performance, they failed to get going at the throw in and they were punished for this. Their star man Alan Cadogan was expertly marshalled by Seadna Morey and they were too reliant on the Douglas man in the lead up to the final. They did put in a solid second half when the game was as a good as over, which is a positive for the Cork contingent. They will learn from this experience and keep their conveyor belt of talent ticking through to their senior team. 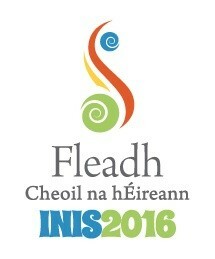 Robert O Shea and Michael Collins did well for the Leesiders. Prior to 2009, Clare had failed to win a Munster U-21 title, now there is an elite bunch of players that have done a three in a row (Seadna Morey, Tony Kelly, Colm Galvin, Aaron Cunningham and Cathal Tots O Connell). 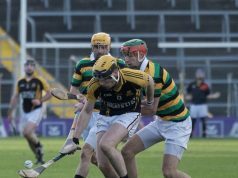 The win now sets up an All-Ireland Semi-Final with Antrim and one area that this side could work on is their half forward line winning more of Keith Hogans puckouts. 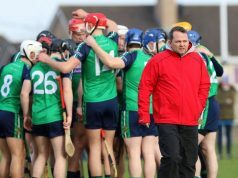 The side managed by Donal Maloney and Gerry O Connor blitzed their opponents and are a real force to be reckoned with in the competition just as their performance showed. They have talent and class in abundance and it will take a great team to take them down, but they mustn’t get complacent. 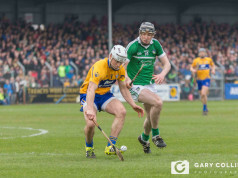 For the victors, Colm Galvin was superb as he covered every blade of grass in Cusack Park, Jack Browne silenced his critics as he swept up ball after ball in the Clare defence, Seadna Morey quietened the threat of Alan Cadogan, up front Aaron Cunningham was always a danger, while Conor Cleary and Eoin Enright did well also. After the game Tony Kelly received the trophy of Munster Council Chairperson and Clareman, Robert Frost. Clare: Keith Hogan (Clooney-Quin), Jack Browne (Ballyea), Seadna Morey (Sixmilebridge), Jarlath Colleran (St Josephs Doora Barefield), Gearoid O Connell (Ballyea), Conor Cleary (Kilmaley), Jamie Shanahan (Sixmilebridge), Colm Galvin (Clonlara) (0-03), Eoin Enright (Kilmaley), Peter Duggan (Clooney-Quin) (0-02), Tony Kelly (Ballyea) (0-03 165), Bobby Duggan (Clarecastle) (0-10 5f 165), David Reidy (Éire Óg) (0-03), Aaron Cunningham (Wolfe Tones na Sionna) (0-04), Shane O Donnell (Éire Óg) (1-00). Subs: Shane Gleeson (Cratloe) (0-02) for B Duggan (41:51), Cathal Tots O Connell (Clonlara) (0-01 1f) for O Donnell (54:43), Alan O Neill (St Jospehs Doora Barefield) for Cleary (56:16), Shane Mc Grath (Feakle) for Enright (57:20), Brian Carey (Sixmilebridge) for Colleran (58:31). Cork: Patrick Collins (Ballinhassig), Stephen Murphy (Blackrock), Colm Barry (Castlelyons), Cian Buckley (Na Piarsaigh), Kevin Cavanagh (Carrigaline), Michael Collins (Ballinhassig) (0-03), Cillian Burke (Midleton), Darragh Brosnan (Brian Dillons), Cormac Walsh (Midleton), Rickard Cahalane (Ballymartle), Shane O Keeffe (Blackrock) (0-01), Colm Spillane (Castlelyons), Robert O Shea (Carrigaline) (0-07 4f 165), Alan Cadogan (Douglas), Anthony Spillane (Castlelyons) (1-00). Subs: Mark Sugrue (Bandon) (0-01) for Walsh (13:15), Killian Mc Intyre (Carrigaline) (0-01) for Cahalane (H/T), Mark O Connor (Douglas) for A Spillane (51:25). 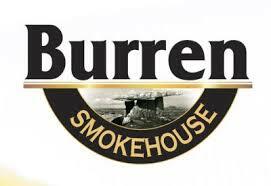 @Woolberto after the demolition of Cork by Clare tonight how can you believe that Clare cannot beat the current Cork team ever? 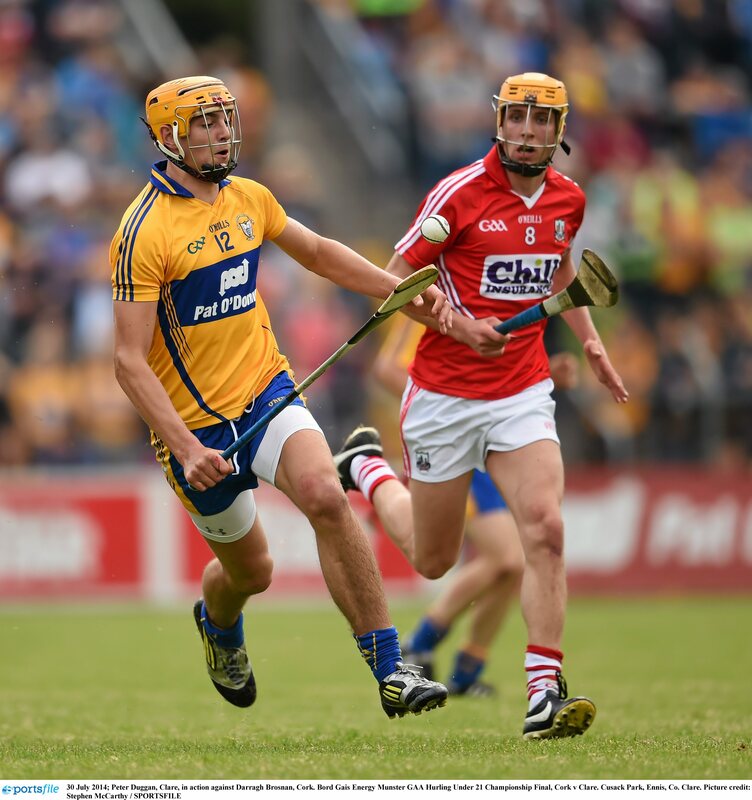 Geared down a little in 2nd but #Clare still way too good for #Cork. 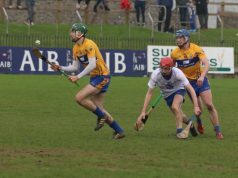 A historic 3rd Muns 21 title in a row for Clare's golden generation. Brilliant performance by Clare. 3 in a row achieved ! Clare 1-28 Cork 1-13. Colm Galvin Man of Match.